Ahh, it's that time of the year again. Around my neck of the woods, the weather is crisp and cool, there's the smell of a roaring, cozy fireplace in the air, all the Christmas decoration is up everywhere, and the holiday spirit is definitely here. It's time to break out last year's Christmas list, get those holiday cards written and sent, and decide who's naughty or nice. ;) This year, I'm doing a little better financially, so instead of handmade gifts, I decided to get the majority of them from my favorite online shopping site. I bet they love me because I placed about five separate orders in the span of two weeks. I am still making knitting things this year, though. I try to keep myself as busy as I can around the holiday season, because I think as I get older, it gets harder and harder to battle the holiday blues. For me, it's good to have projects that need to be worked on, things that need attended to, in order to not dwell on the negativity in life that makes everything hard to deal with this time of year. So far it has been okay, and I'm not feeling the sense of dread hanging above my head as much. :\ In my 2+ years of adventures in knitting, I've done a few non-scarf projects I'm actually proud of. Other than that I haven't done much else complicated people-size. Perhaps I'm just up for the instant gratification of small scale knitting, or it's probably because I like knitting for its relaxing, going on auto-pilot aspects - as soon as it gets to counting stitches, using stitch markers, reading patterns (LOL), I get flustered and give up. I also like knitting things as gifts, and anything other than sweaters get a little more complicated as well. What if it turns out too big/small/loose/tight? What if the giftee hates it? There's so much time and effort that goes into every project that I would just be crushed if I knit someone a sweater they never wear. So far it's only scarves for me, thank you very much. The first scarf I completed this year is the Sampler Scarf (see above). It was a fun way to practice different stitches and to get a handle on tension and stitch size. 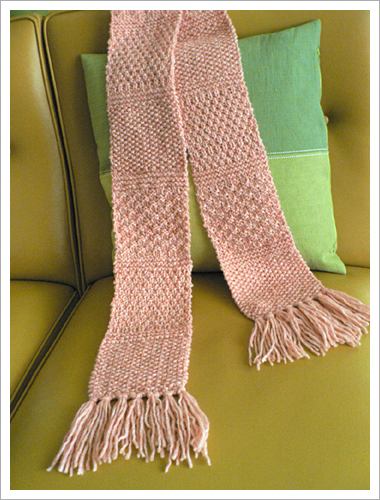 The yarn I used is the Peach Dolcetto yarn from Jo-Ann's Sensations Bellezza Collection. I highly recommend it - it's a wool/cotton blend, non-scratchy, incredibly soft and easy to knit with, plus it's Italian-made and sold at a great price. Trust me, you can't find much Italian wool for $5 a skein! The stitches I used are seed stitch, double seed stitch, and box stitch - and plain ol' garter stitch as dividers. I really like how it turned out. I had purchased this Rowan Biggie Print yarn in Giddy about two years ago after seeing Winnie's Troll scarf. Using the basic garter stitch and only six stitches across, this was hands down the fastest knitting project I've ever done - on sz 35 needles, I finished it in one sitting on Thanksgiving evening at the in-laws. It's definitely a conversation starter too, everyone from B's grandma to his cousin's 8-year-old boy took an interest to my huge knitting needles and super-thick yarn. And they all went "WOW!" when I did my binding off two hours later. If you're into some quick & dirty knitting, this is definitely a fun one to try. 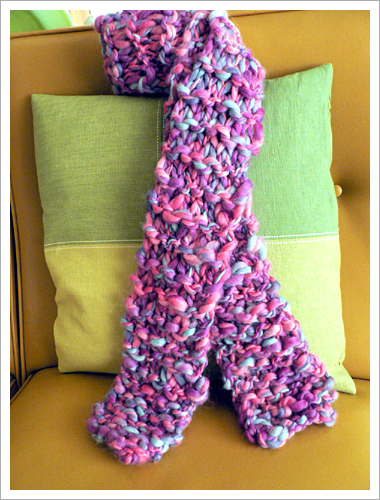 I also knitted two scarves using Karabella Puffy yarn in color #50. It's a deep, rich red and perfect for the holidays. On size 15 needles, I could do one scarf in two evenings. The Puffy yarn is Italian-made merino wool, super soft with a warm, luxurious feel, and not scratchy at all. It is also a bit on the pricey side (it takes two skeins to make a scarf), so choose your recipients wisely (AKA people who appreciate $15-a-skein Italian merino wool)! I didn't get a chance to take photos of them because I was in a rush and had to give them away, but I hear they are well-loved and worn often. Yay! Seeing fellow knitters' work has certainly been very inspirational. Maybe I'll even attempt something 3D and people-size soon, and for myself! There's just so much more to learn and try, it's going to be an exciting crafting endeavor indeed. I also received a crocheting kit for my birthday earlier this year and it's something I'd like to try (and master) in 2007!